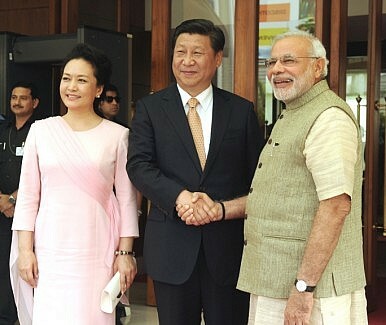 Modi welcomes Xi to India in September, 2014. One of these episodes, in September 2014, saw 1,000 Chinese troops enter Indian-controlled territory on the western end of the border just after President Xi Jinping arrived for a highly anticipated visit to India. Although it remains unclear whether Xi ordered the incursion or whether it was the result of a decision by a local commander. It was nonetheless seen by Indian observers and military officials as a deliberate “slap.” India offered a stiff response and Modi requested that Xi intervene, but the stand-off persisted for more than a day. Whatever the motivation behind the incident, it soured the tone of Xi’s visit. Ultimately, China announced only $20 billion of investment in India, rather than the $100 billion promised a few days earlier by its consul-general in Mumbai. For this round of border talks, China’s choice of delegation members is a positive sign, but the build-up along both sides of the border requires more proactive measures to reduce tensions. India under Modi is pursuing a more bellicose approach. Modi, like his predecessors, visited the northeastern state of Arunachal Pradesh, an Indian state which China claims in its entirety. More unusually for India, where former military officers rarely participate in politics, Modi appointed retired Indian Army COAS General VK Singh to a dual portfolio as junior external affairs minister and cabinet member responsible for the northeast development. Although he was replaced in the latter role after six months, Singh was the first military officer ever to hold the post. Singh’s role as cabinet point man on the northeast has been assumed by Kiren Rijiju, a native of Arunachal and a junior cabinet minister for Home Affairs. Rijiju has proved an outspoken and relatively high-profile member of the administration; in November alone he came close to accusing China of supplying weapons to insurgents in India’s northeast and called for India to continue its support for the refugee Tibetan community. Finally, India recently finalized two long-gestating purchases that could augment its capacity in the northeast: 15 Chinook helicopters, suitable for carrying heavy loads in high altitude areas, and 145 M777 lightweight howitzers from BAE Systems. The guns and the Chinooks are interoperable and are destined in part for India’s new Mountain Strike Corps, based on the border with China. India is also testing the status quo by encouraging increased settlement in sparsely-populated areas on India’s side of the LAC. New Delhi is working to increase connectivity and availability of government services in the region, moving ahead with construction of a road connecting isolated villages in Arunachal, near the Chinese border; the 900-mile road is due to be completed in January 2018. Construction will begin on a second, 1200-mile highway that same month. Rijiju denies that India’s efforts are aimed at China, but his claim that India is only “securing its territory” is incompatible with China’s position that the entire area belongs to China. The more thickly settled the border area, the more unlikely it is that India will consider ceding this territory to China. For its part, Beijing’s military modernization efforts have only heightened tensions with India. A newly avowed emphasis on China’s maritime interests created ripples of concern among Indian strategists, and China’s effort to build a modern joint warfighting force continues to draw attention from wary Indian analysts. Large-scale Chinese infrastructure projects in Tibet generated considerable unease amongst Indian analysts concerned about the military utility of additional runways, roads, and railways, and China’s almost year-round deployment of advanced fourth generation J-10 and J-11 fighter aircraft in Tibet has likewise attracted scrutiny. The August 2015 live-fire joint exercises in the Chengdu Military Region – which borders India – likely did little to mitigate the tension. In light of China’s tendency to provoke border incidents whenever high-level talks are in the offing, warm words alone, even from a CMC vice chairman, remain unlikely to defuse border tensions. The cautious tone of each country’s readout from the meeting was in marked contrast to the warmth displayed in Singh and Fan’s visits elsewhere. Each used his travel schedule to send a clear message about their countries’ foreign policy priorities: the morning after Fan’s arrival, Singh left on a visit to Japan, where he was the guest of honor at a dinner hosted by the chief of staff of the Japan Ground Self-Defense Force. Similarly, Fan traveled to India via Pakistan, where he met with Pakistan’s Chief of Army Staff Raheel Sharif and Prime Minister Nawaz Sharif. Sharif used the occasion to describe the Pakistan-China relationship as “the corner stone of his country’s foreign policy,” while Fan praised Pakistan for its fight against terrorism (specifically the East Turkestan Islamic Movement) and described China and Pakistan as “the best iron brothers” – echoing Nawaz Sharif’s phrase during Chinese president Xi Jinping’s visit to Pakistan in April. Neither Beijing nor New Delhi wants war. India needs Chinese investment, and China sees India as an important market for its goods. But inertia is not on their side: unless they can take positive actions to reverse the current trend on the border, they risk drifting into a growing conflict. Sarah Watson is an associate fellow with the Wadhwani Chair in U.S.-India Policy Studies at the Center for Strategic and International Studies. John Chen is a research intern with the China Power Project at the Center for Strategic and International Studies and a Master’s candidate at Georgetown University.